Hanging on display in the United States Navy Yard in Washington, D.C., is a battered and scratched steel plate, two feet in diameter, edged with more than one hundred little semicircles. For more than eighty years, people have wondered how it came to be there and at the story it could tell. 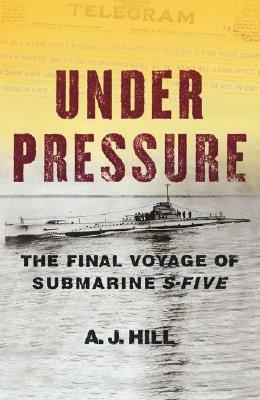 "Under Pressure: The Final Voyage of Submarine S-Five" is that story. On Monday, August 30, 1920, the "S-Five," the newest member of the U.S. Navy's fleet of submarines, departs Boston on her first cruise -- to Baltimore for a recruiting appearance at the end of the week. Two days later, as part of a routine test of the submarine's ability to crash dive, her crew's failure to close a faulty valve sends seventy-five tons of seawater blasting in. Before the valve can be jury-rigged shut, the "S-Five" sits precariously on the ocean floor under 180 feet of water. Her electrical system is shut down, her radio too weak to transmit, and one drive motor is inoperable -- and, because of a last-minute course change, the sub has gone down in a part of the Atlantic deliberately selected because it is well outside any regularly trafficked sea lanes. Rescue by a passing ship is virtually impossible. No one expects them in Baltimore for another two days. And forty hours worth of air is all they have left. The "S-Fives" are on their own. Her captain, Lieutenant Commander Charles M. "Savvy" Cooke Jr., tries to pump the seawater out, but each of three pumping systems fails in succession. The salt in the seawater combines with the sulfuric acid in the sub's batteries to create a cloud of chlorine gas. They have little air, no water, and only the dimmest of light by which to plan their escape. By shiftingthe water in the sub toward the bow torpedo room, Cooke is able to stand the 240-foot-long sub on its nose, bringing it close to vertical, and, using trigonometry, he calculates that at least part of the boat's stern is now above sea level. In a race against time -- will the crew die of asphyxiation before chlorine gas poisoning? -- Cooke assembles his crew into three-man teams charged with cutting a hole out of the highest point in the sub: the telephone-booth-size tiller room. With no acetylene torch, no power tools -- nothing but ratchet drills and hacksaws -- the crew must cut through nearly an inch of strengthened steel or die in the attempt. "Under Pressure" is the story of the thirty-six-hour-long ordeal of the crew of the "S-Five." It is a story of the courage, endurance, and incredible resourcefulness of the entire forty-man crew: of Charlie Grisham, the sub's executive officer, a "mustang" promoted to the navy's officer corps from the enlisted ranks; of Chief Electrician Ramon Otto, whose baby daughter was born just days before the "S-Five's" departure; of Machinist's Mate Fred Whitehead, who at the last minute is able to dog the all-important watertight hatches shut; of Chief of the Boat Percy Fox, who redeems himself for the failure to close the induction valve that sank the "S-Five; " and of the sub's indomitable captain, Savvy Cooke, leading his crew through sheer force of will. An incredible drama, a story of heroism and of heroes, "Under Pressure" is that most remarkable of books, a true story far more dramatic than any fiction.